Guided walking tour of Bordeaux's must sees with gourmet breaks. Discover the broad outlines of Bordeaux's history while savouring its gastronomic specialities, which often reveals a lot about the city's identity. Where to taste specialities in Bordeaux? The Southewestern France is well known and appreciated for its gastronomic specialities. If the name Bordeaux is very often associated with wine, it is nevertheless a gourmet city, very GOURMANDE! And yes, if the reputation of Bordeaux wines is well established and the richness of Bordeaux's architectural heritage is no secret, we cannot ignore its gastronomic richness! 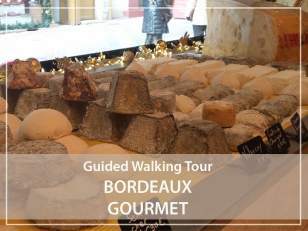 I guided walking tours in Bordeaux city with a licensed tour guide. You will thus understand the major steps of the creation of the city in a meander of the Garonne river and its evolution over the centuries... Of course, we will not miss to evoke the world of wine and the men who developed its trade and were largely involved in the construction and embellishment of the city. But that's not all! Enjoy your visit to Bordeaux and its most beautiful monuments with tasting some samples of the local specialities.... I suggest that you include in our discovery tour of Bordeaux a few gourmet, sweet or savoury stops... Why not take a few minutes to taste the famous "cannelé de Bordeaux" in just a few more chocolates in one of Bordeaux's famous craft chocolate factories? If I ask you what are the specialities of Bordeaux? The Cannelé! Legend is that the Cannelé de Bordeaux (or Canelé) was born when the flour boats disembarked on the docks of Bordeaux. But more likely, it would have been invented in the 18th century by the nuns of the Annunciades convent... One thing is certain: the ingredients of the recipe for this local cake are intimately linked to the history of Bordeaux and wine... I won't tell you more about it here but come and discover with me why this famous Bordeaux canelé is a concentrate of local history! Closer to us in time, I can only encourage you to taste the Dune de Bordeaux, a light stuffed-pastry with an extremely savoury whipped cream that is meant to be a hymn to the highest dune of white sand in Europe: La grande Dune du Pyla. Just one piece of advice: watch out for black pants! I offer to cross our exploration of the city of Bordeaux with several gourmet stops. I have selected for you some addresses where you can sample our local gastronomy: from cheese to bakery to exceptional chocolate makers. Come and meet passionate people, craftsmen of "good taste" and "good food". During this visit, I suggest you take the tram if necessary to immerse yourself in the daily life of Bordeaux. Finally, why not end this visit with a picnic basket that we could share in the shade of the trees of our public garden? Attention : This visit can be scheduled every day except Sunday and Monday - Saturday is not recommended because of the crowd in shops. Then come and taste Bordeaux!